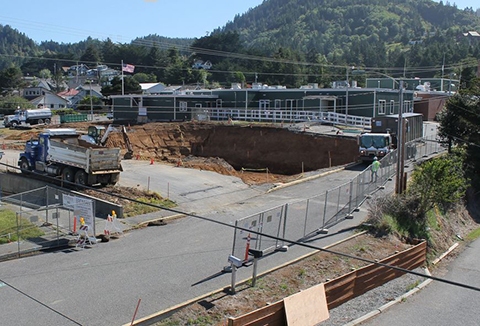 GOLD BEACH, OR (June 12, 2015) - Curry Health Network today announced that a time-lapse camera has been installed at the construction site of the new Curry General Hospital in Gold Beach. The special camera captures a still photo every 10 minutes from 6 a.m. to 6 p.m., and all are available to see online. At the end of the project, or at key milestones, the images will be looped together to result in a time-lapse video. "This is a wonderful way to keep the community up to date on construction progress, and the location and angle of the camera provide a vantage point that shows more than what can be seen from outside the fence," said CEO Ginny Razo. "At the end of the project, we'll be able to watch the entire process, from beginning to end, in just a few minutes. We're very excited to have this resource available to share with our community." At the Network's request, Erdman Company, the Wisconsin-based design/build firm who has designed and is building the 60,200 square foot multi-level facility that is slated to open in late 2016, installed the camera. The existing hospital will remain open throughout the entire construction process.